First, add the images to be renamed to the list. 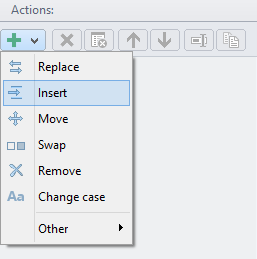 You can either use the selection dialog, or add the files/folders using drag and drop onto the program interface. The next step is to specify the part that should be replaced by the numbering. If, as in this example, the entire file name should be replaced, select the entry The Whole Name from the menu. In the action menu select the type Consecutive Numbering. If necessary, you have the possibility to customize the numbering. For example you can set the initial value or the number of leading zeros.